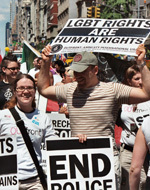 Thousands of lesbian, gay, bisexual and transgender people across the USA are victims of a system that fuels discrimination and facilitates torture, ill-treatment and impunity, said Amnesty International today as it launched a report on police abuses against people on the basis of their sexual orientation or gender identity. The report “Stonewalled – Still demanding respect” is based on interviews conducted by Amnesty International (AI) between 2003 and 2005 with members of the LGBT (lesbian, gay, bisexual and transgender) community, victims of gender-based violence, survivors of police abuse, activists, lawyers and law enforcement officials across the US. “The interviews reveal a very clear and worrying pattern. Cases of beatings, sexual violence, verbal abuse, harassment and humiliation by law enforcement officials against LGBT people take place on any given day in detention centres, prisons, in the home, and on the street,” said Amnesty International. In 2004 a women from Athens, Georgia, said she was forced into her apartment at gunpoint by a former County Deputy and raped because she is a lesbian. She said the officer vowed to “teach her a lesson”. Within the LGBT community in the USA, transgender people, members of ethnic or racial minorities, young people and immigrants are particular targets of police abuse. A Native American transgender woman told AI that in October 2003 she was stopped in Los Angeles by two police officers as she was walking along the street in the early hours of the morning. According to her testimony, the officers handcuffed her and drove her in the police car to an alley off Hollywood Boulevard where she was beaten, verbally abused and raped. After her ordeal she was thrown to the ground and told "that's what you deserve." Despite the significant progress over recent decades in the recognition of LGBT rights in the USA, persistent discriminatory attitudes have created a situation in which abuse of LGBT people is frequently dismissed as "normal". Victims often do not report police brutality and other crimes against them because they fear hostile or abusive response from the police and because, as they know, many reported abuses are not properly and impartially investigated. "There are still some discriminatory laws; but the bigger problem is the discriminatory way in which many laws are applied, which often results in the arrest and detention of individuals just because of their sexual orientation or gender identity," said Amnesty International. In December 2003, a young African-American gay activist was waiting at a bus stop when Chicago police officers arrested him allegedly for loitering with intent to solicit. Despite providing identification and corroborating information from the organization he represents, he was detained for two days. “Effective reform requires the backing of the highest ranks. There needs to be a fundamental understanding of the right to freely express one’s sexual orientation or gender identity,” said Amnesty International. Amnesty International is calling on US federal and state authorities to take action to prevent discriminatory application of the law, to investigate all allegations of sexual, physical and verbal abuse against LGBT people by their officials and to bring those responsible to justice. Amnesty International’s report is part of a campaign on the issue of police abuse against LGBT people in the USA launched in September 2005. Amnesty International will also be presenting its range of concerns about the situation of human rights in the USA to the UN Committee Against Torture and the UN Human Rights Committee during 2006.